What?? Who is at the door…? It’s Sunday yaa… Rubbing my eyes and scratching my head, I opened the door (very irritated) to find no one was outside. I Slammed the door and pulled my hair up to tie them together into a bun. With both my hands, I was struggling to put my thick beautiful hair fit in a rubber band. My band popped and fell on the floor, I quickly reached out to pick it up and noticed few strands of hair on the white marble. Squatted down to look closely, and to my surprise saw long hair strands, picked few of them and tried to examine holding end to end. My eyes turned into a magnifying glass and found more hair on the floor. With both my hands, I crawled to my bedroom picking hair one by one. Then, climbed the bed and dusted my pillow to find more hair. It was shocking, very shocking! I was losing my love locks, my lovely beautiful tresses!! Silently sitting in the living room, I tried to understand the root cause of my hair fall. I recalled the many chemical treatments on my hair in past few year. Didn’t know. What could be the reason? But, I need a solution to all my problems – hair fall, dandruff, dryness and most importantly – weak hair follicles. I realized the solution was not a hair spa or a keratin treatment or any ampoule treatment. I needed a permanent remedy at home. The remaining part of my day was spent Googling about hair care, prevention, cure for hair fall & hair related problems. Found many natural remedies, some were practical and some were not. I wanted a product that would repair my hair follicles and strengthen my tresses and of course a quick fix. 5 hours later, I stumbled upon a product called Fairfax Hair Energizer for Colored & Chemically Treated Hair – a product from Switzerland that promised the care I needed for my hair. After, researching about the product I reluctantly ordered it via Amazon prime and received it super quickly in just two days. I ripped apart the Amazon package and curiously fished for my only hope i.e Fairfax Hair Energizer. Inside, I found a bright pink cylindrical hardboard box which I carefully twisted and pulled the top to open and there it was – a bottle with foam cushion and short instruction manual. By now, I was impressed with the product packaging and was already getting convinced that the product would work for me and could not wait to use this Herbal water. In a small bowl I spooned out some coconut oil and microwaved it for 10 secs, once the oil was warm, I added 4 drops of Fairfax hair energizer. Mixed well with my fingers, dipped a cotton ball and applied the mix on to my scalp. Massaged the mix from roots to the tip of my hair. After 2 hours I washed and shampooed my hair, blow dry and gently combed hair to detangle, and noticed that the dandruff on my scalp was gone. I could not believe and so decided to wait for 2 more days to see if dandruff would come back. Two days later, I am standing facing the mirror and with my finger nails, scratched my scalp to see if dandruff was back? I did see some snowflakes on my scalp (which was remarkably less than I expected) and decided to use Fairfax hair energizer again for better results. After, shampoo rinsed my hair with Fairfax hair energizer. This time, while combing I noticed less breakage of hair and a cleaner scalp. By now, I was quite confident about Fairfax hair energizer. And continued to use it for another 4 weeks. About a month later, what I observed was like magic – no hair fall, no dandruff, luster and smoothness in the hair. Below, I am sharing my review for this magic portion i.e Fairfax hair energizer for you all. 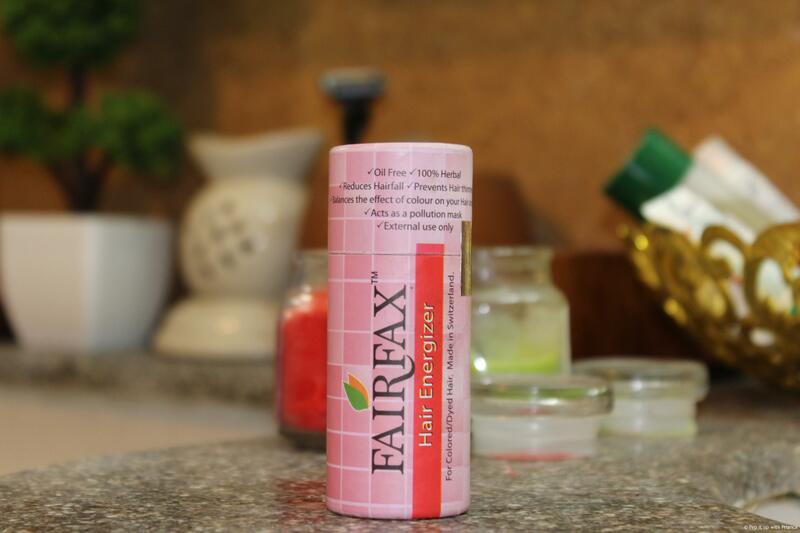 What is Fairfax Hair Energizer? 100% herbal formulation containing pure herbs that are known to reduce hair fall, controls dandruff, maintains the health of hair follicles and strengthens roots. This product is manufactured in Switzerland & is certified as safe for human scalp by Swiss Export Control. Fairfax smells like a medicine, don’t expect a fancy intimidating fragrance like in any chemical hair product. It is 100% organic. What to expect from this herbal water (Fairfax Hair Energizer)? 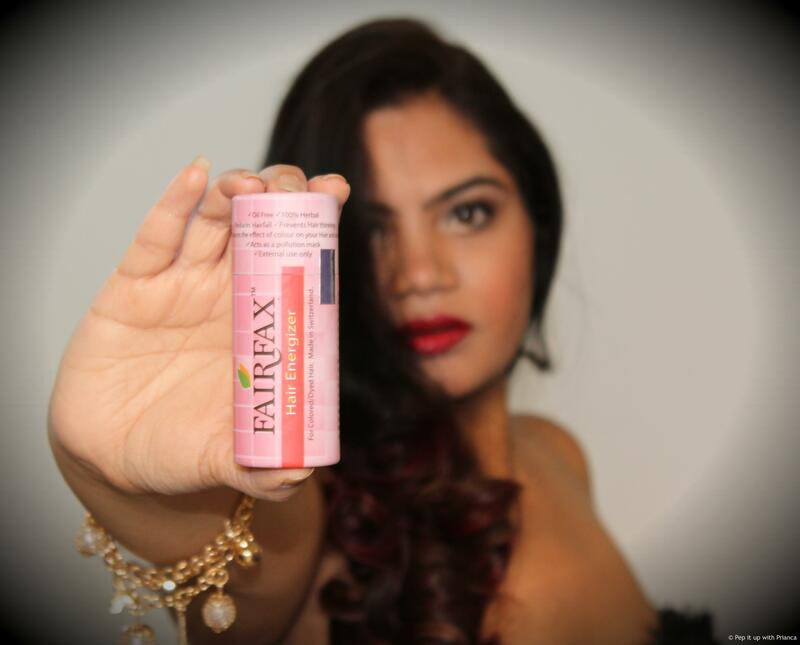 Anyone can use Fairfax, its one solution to all hair problems. But, I would personally recommend it to females with chemically treated and colored/dyed hair. Chemicals extract the moisture from the hair resulting in brittleness and dullness. Fairfax ensures to repair the hair follicles and provide the needed luster and strengthen hair. 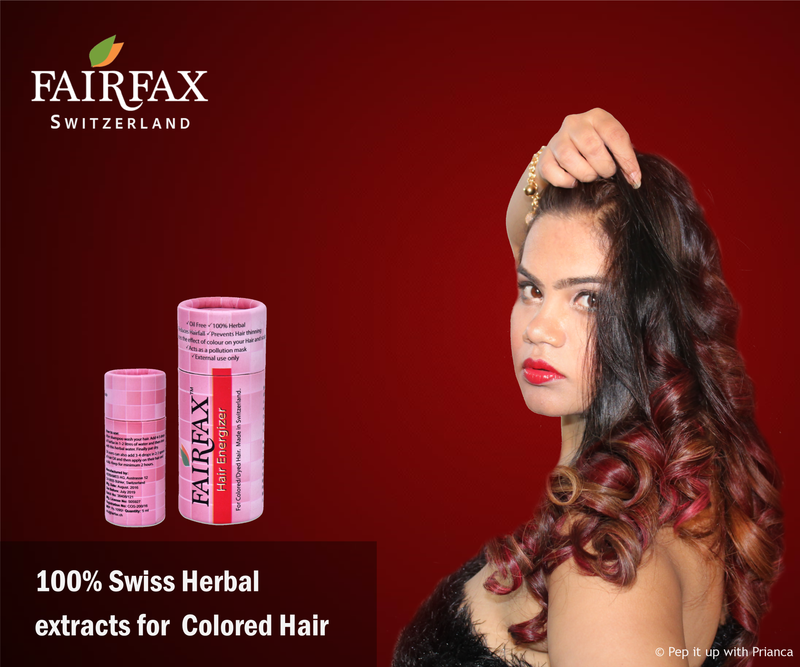 Since, Fairfax hair energizer is gentle yet effective, the hair color/dye will not come off after using this herbal water. I used the product for about a month, sometimes applied to my scalp with oil and mostly rinsed my hair with Fairfax after shampoo. This Swiss made herbal water works for me so ordering my second bottle from Amazon. How to use Fairfax Hair Energizer? There are two ways to use this herbal water. After shampoo, rinse your hair with about a litre of water containing four drops of Fairfax Hair Energizer. Pat dry. Put four drops of the liquid in any hair oil you normally apply it to your scalp & hair. Keep it on for a few hours before washing it off with a mild shampoo. Click here to buy Herbal Fairfax hair energizer now from amazon. P.S. – I am coloring my hair honey blonde ombre. Cause, now Fairfax Hair Energizer will keep my hair healthy. Previous article3 Homemade Instant Glow and Skin Whitening Face packs with Just 3 Ingredients! Yes, Fairfax hair energizer is effective for dandruff and hairfall. I would recommend you to use this herbal product by mixing it in oil and applying it on scalp first for about 3 weeks. Then, continue to rise with just water that contain drops of Fairfax hair energizer. You will notice no dandruff and less hair fall. Worked for me and i am sure will work for your hair too.